Down syndrome is a genetic condition that can be caused by one of three chromosomal abnormalities. Three to four percent of the individuals with Down syndrome have translocation, a condition in which each body cell has 2 sets, plus an extra piece, of chromosome 21. 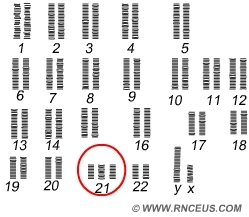 Finally, 1-2% of all persons with Down syndrome have trisomy 21 mosaicism, a condition in which only some of the bodys cells have three copies of the 21st chromosome. The National Down Syndrome Society (NDSS) has an interesting article entitled "What Causes Down Syndrome." Adolescents with Down syndrome almost always have some degree of mental retardation, but it is usually in the mild to moderate range. There is a wide variation in the communicative and cognitive status of teens with Down syndrome. Some speak clearly and understandably, others have significant issues with grammar and articulation, and a small number depend on augmentative communication devices. Many adolescents with Down syndrome attain functional levels for reading, writing, and math; others have been less successful in these areas. While there is usually some degree of impairment in both fine and gross motor skills, many teens with Down syndrome are good athletes and enthusiastic participants in community life. Adolescents with Down syndrome often have certain physical characteristics, including low muscle tone and distinct facial characteristics.